Lucifer: the "L" is surely a Mass entertainer! This was one of the many punch dialogues that the beloved Lalettan aka Mohanlal delivered on the silverscreen in his latest mass entertainer, Lucifer! The movie was quite engrossing, and it made me want to write a review - one after a very long time! 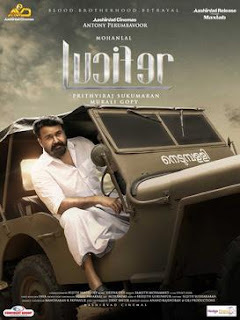 Lucifer is a new Malayalam movie directed by Prithviraj Sukumaran and produced by Antony Perumbavoor (under his banner, "Aashirvad Cinemas"). The movie is a political thriller, revolving around a power struggle over finding a successor, following the death of the state's chief minister. The movie, which is Prithviraj Sukumaran's first directorial venture, is a stylish movie, and uses background score to enhance the effect of the way the story is told. The director has taken a lot of effort to ensure the continuity of scenes. The story by Murali Gopi has been turned into a marvelous entertainer by Prithviraj and his team.